Corruption is a major issue in India. It ought to be, because according to Transparency International's Corruption Perceptions Index, the country ranks at #94, tied with Djibouti, Greece, Benin, Colombia, Mongolia, Senegal and Moldova. Of course, the gross effect of this is much bigger in India, simply because of the larger size of the economy. The agency also reported that about 40% of people in India had personally paid bribes to get their jobs done. These figures only take into account petty cases. Corruption seems to have grown in the country over the last few years, given the number of high value cases that have been reported – the 2G scam, Commonwealth Games, coal scam, Adarsh, food grain scam in Uttar Pradesh, railways recruitment scam, and so many others. But corruption isn’t anything new here. Rajiv Gandhi, a former Prime Minister (1984-1989) said while he was the head-of-state that only about 15% of money actually reached its beneficiaries. The Supreme Court of India also issued a statement that compared corruption with plague, slavery, and the HIV Virus. Another former Prime Minister, Narasimha Rao (1991-1996) had to stand in court because of corruption charges. Several other politicians and bureaucrats have been jailed. Consider these facts. According to a report published in 2010 by The Hindu, Indians have more than $1456billion stacked away in Swiss banks. This means, as much as 13 times of India’s national debt is parked away in this European country [PDF from 2014]. Money has also been stashed in the Bahamas, St. Kitts, and other locations. Another report that was published by the Swiss Banking Association says that there’s more black money from India in Swiss banks than the rest of the world combined. Staggering! The Indian public of course is tired of all this. 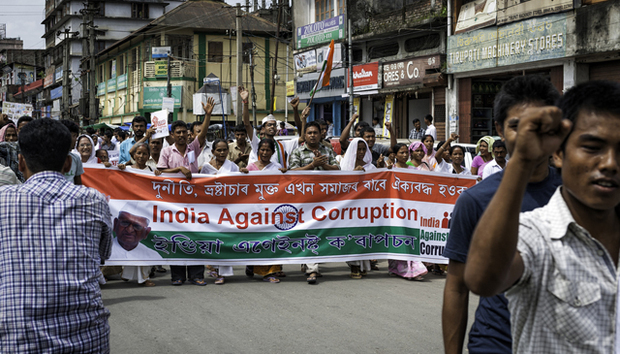 A series of anti-corruption protests and demonstrations were held across the country in 2012. This caused quite a flutter. The AAP (Aam Aadmi Party) was established, with almost a single-point agenda to root out corruption. Governments had to sit up and take notice. They had to be seen doing something to remove, or at least reduce corruption. Enter eGovernance. It is supposed to bring in transparency and cut corruption. It remains to be seen how effective it’s going to be. But on the ground, eGovernance is, today, a big hope in the country. The government of India and several local administrations have already made eGovernance mandatory. It’s currently being rolled out. eGovernance is reducing the people’s interactions with government officials, and this is expected to bring down corruption considerably. It is likely to speed up projects as well, besides helping people get their jobs done without having to pay a bribe. This seems logical. After all, the chain would be broken if there is no direct contact between a receiver and provider. There cannot be any scope for negotiation. With eGovernance, government departments are cutting down on paperwork as well. A student asking for a scholarship has to keep visiting the government offices now and pay bribes to touts and clerks for any luck. eGovernance is changing that. Applications can be made online. The latest status can also be checked and a complaint ticket can be raised too, if the file is not moving. There is increased accountability because queue jumping can now be detected easily. The Indian state of Maharashtra alone pays scholarships to more than 1.5 million students every year. It’s a lot of people considering the fact that there are 30 states in India. In the future, each state government is going to have a single server where all the data will be stored, instead of different servers for different departments. With data integration, government departments don’t have to keep exchanging letters anymore. This will quicken up processes considerably. Naturally, it’s going to be a huge relief for the citizens. Centralized data can improve analysis and audit too. Private tech players in the country, like TCS (Tata Consultancy Services) and others, have been roped in already to create and manage the central databases, and carry out different processes. For instance, TCS is already managing passport processing in the country. Applications are received online, an applicant can make payments and dates are also generated. The result of this has been very positive. Passport applications and renewals are now processed at record speed. In fact, TCS has processed more than 300,000 applications in less than two years. There was a lot of corruption here and many agents. That has decreased remarkably. Peter Eigen, who is the Chairman of Transparency International, says that corruption is an important cause of poverty. It is certainly a contributor in India. Public investment becomes more costly because of corruption. It brings down government income and delays the growth potential of the country. Corruption restricts the citizen’s access to public services, which they are supposed to receive for free. eGovernance can change all that. It certainly has the potential. But will it work? That is the big question in the country now. After all, corruption is extremely deep rooted in India. Skoch Consultancy Services carried out a survey of 21 eGovernance projects. The findings of this survey concluded that there is a considerable decline in corruption because of eGovernance. As many as 81% respondents said that it has gone down. The Center for Media Studies carried out another study among 4500 people in five cities – Delhi, Mumbai, Hyderabad, Chennai and Kolkata. Basic services were covered like railways, water supply, hospitals, urban development, civil supplies, municipal corporations and electricity. The report stated that corruption has come down by more than 50% in Hyderabad, thanks to the presence of eSeva centers [PDF]. It has been even better in Chennai and Kolkata. Corruption in these cities is down by more than 60%. Corruption remains unchanged in Mumbai, while it has actually gone up in Delhi. So it seems like, the early implementation of eGovernance is certainly working in India. But what about all those government contracts where the public is not directly linked up? Corruption may not go away completely even with eGovernance, but it is bound to decrease if there is a general call for cleaner systems. And with the citizens clamoring for a corruption-free state, this will mean more watchdogs to monitor everything more closely. All this has got to be good news.